After the uplifting result against Spurs in the league the previous Sunday, I was cautiously optimistic about this game. During the week the club had signed the 6' 2" Argentinian striker, Guido Carillo from French Ligue 1 champions, Monaco. Although not terribly pacey, he gives the team something they don't have at the moment, namely a physical presence in the opposition penalty area. This is clearly a shortcoming at the moment, as we are creating a hatful of chances each match, but in Long and Gabbiadini, we just don't have a striker with the height to take advantage. Anyway, Carrillo was on the bench for this match, with the energetic Long starting up front. Davis was back in the side, at the expense of Lemina, Long and Boufal replacing Gabbiadini and Ward-Prowse, but was otherwise a full strength side, which considering the crucial League games against Brighton and West Brom this week, was possibly seen as a bit of a risky strategy. From the kick-off Saints went for the jugular, pressing and competing for everything and it paid almost immediate dividends. From a Free kick, wide on the left, Bertrand sent over a cross, which was not defended very well and in the mêlée, Jack Stephens, celebrating his 24th birthday, stuck the ball beyond Karnezis in the Watford goal. It was the young English defenders first ever goal for the club as well. Saints were 1-0 up and it was only the 4th minute. The rest of the first half was a story of relentless pressure from Saints, coupled with missed chance after missed chance. More often than not, it was Long doing the missing, although he was causing the visitors all sorts of problems. The visiting supporters were amusing themselves by abusing their own team, even at this early stage in the game and to be honest, who could blame them, as they were appalling and McCarthy really had very little to do all afternoon. Just before the break Bertrand, who had looked as if he had been struggling for much of the match, didn't get up after a tackle and you could tell from his body language that he was going to have to go off. He was replaced by Pied, who is very much a right footed right back, as the other back-ups for the left back slot were unavailable. McQueen was still injured and just a few days earlier Matt Targett had been signed on loan by Championship side Fulham for the rest of the season. Half-time came, with the score unbelievably still 1-0 and Watford couldn't have complained if they had been two, or three goals down. The second half started off in the same vein as the first, with Højbjerg hitting a thunderous shot from about 30 yards out which cannoned off the crossbar and Cédric almost getting through at a tight angle, but managing to get tangled up with a couple of defenders, which ended with the little Portuguese getting booked. Then came the almost inexplicable moment of the match, when Mauricio Pellegrino substituted the very effective Boufal for Yoshida and changed to a back five. This caused no end of discussion in the stands. Why give up the initiative to such a poor team when we had them on the ropes? The only explanation was that Watford had decided the only thing left was to go route one and bypass the midfield entirely. With two right backs, one playing out of position on the left and the other looking as if he was carrying an injury, it looked as if Pellegrino was trying to go safety first and lock up the game, but it was an odd way to go about winning the game. 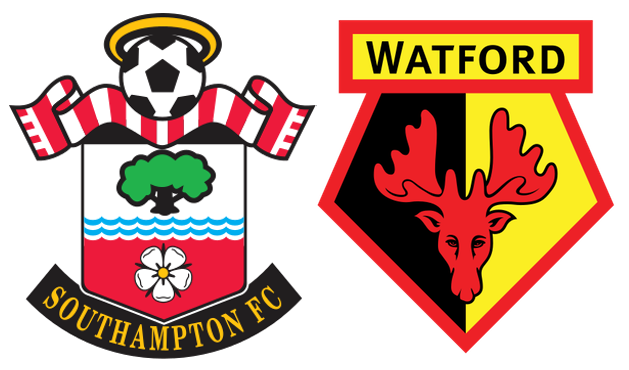 The rest of the game got a bit nervy, as Saints sat back, inviting Watford to attack, which they did, thankfully to little effect. The only light relief for the fans was to see Carrillo make his first appearance for Saints in the 83rd minute, when he came on for Tadić. Not really enough time to do anything, considering Saints were just defending, but at least gave him a taste of the English game. The game eventually ran it's course, but Saints really made heavy weather of it. Unnecessarily so, as they were so much in control. Only one candidate in my eyes, Cédric was absolutely massive in this game. Even when clearly injured, he continued to be a huge influence on the outcome of the game, attacking and defending equally effectively. He must be the best right back that the club has had for years. Probably only to be really appreciated when he eventually leaves the club.